For those of you who aren't familiar with the Daring Bakers, we are a rapidly-growing group of food bloggers/bakers/baked-good enthusiasts who complete one challenging recipe per month and then write about it on our blogs all on the same day. The group encourages learning and expansion of the home baker's repertoire; it inspires its members to bake something that might be difficult to execute, something we might not bake if not for the Daring Bakers mandate. Brilliant, really. This group was made for me, the anti-30-minute-meal cook, she who relishes in recipes that take days to complete and require specialized equipment and techniques. July's challenge was a filbert gateau with praline buttercream. And the cake was, as Husband proudly stated, gateau fabulous. The recipe comes from Carole Walter's book, Great Cakes. An apt title. The confection is a dreamy layered affair, with three gloriously textured yet wonderfully delicate discs of filbert genoise sandwiching thin layers of lighter-than-air praline buttercream and fresh whipped cream. The whole gorgeous thing gets painted with local blackberry preserves and smothered in ganache before becoming a canvas for the artistic whims of the baker, whose medium is piped buttercream. When I first looked at the recipe I thought, OK, I totally get why they call themselves the Daring Bakers. But the written recipe looks a lot more complicated than it truly is. Successful completion of this recipe is all about planning. It's about procuring the right tools. It's about dividing the intimidating-looking whole into its discrete parts, each of which is really quite manageable. I gave myself three days to complete the cake and the end result was a professional-looking gateau that didn't leave me passed out and exhausted on the kitchen floor surrounded by dirty mixing bowls and billowing clouds of cake flour. Challenging, yes! But also reasonable and squarely within the reach of any home baker who has some time, motivation, the patience to cut a two-inch cake into three layers and the ability to skin a hazelnut. The best thing to come out of this challenge -- beyond the totally delicious cake and the immense self-satisfaction, of course -- is a measurable growth in self-confidence. I've been making elaborate desserts and other recipes for years but I'd developed an unfounded fear of melted sugar and Swiss buttercream. Making the filbert gateau with praline buttercream taught me that I had no good reason for this apprehension. My vigilant eye did not permit any burning of the praline, which still kind of amazes me because the technique involves putting sugar and only sugar in a dry skillet and letting it melt into a scalding pool of molten sweetness. I mean, what are the chances of not screwing that up?!?? But the praline gods were smiling and by the time the sugar-encapsulated hazelnuts had hardened and cooled into a golden lacy shape somewhat resembling one of the Finger Lakes, I was sold on my praline-making skillz. As for the Swiss buttercream....The talented Deb of the Smitten Kitchen was once emotionally scarred by Swiss buttercream so, honestly, mental ruin had to be in my future, yes? No! I was so pleased with the way my Swiss buttercream came together that I kept pacing around the house with a spatula full of the finished icing, muttering to Husband, to the dog, to nobody in particular that I couldn't believe my good luck. I am so confident and inspired that, like some sort of baking superheroine, I think I might turn to Swiss buttercream whenever there is a cake in need of frosting. Or maybe I'll make it for no reason, then just walk around with a piping bag full of the stuff, offering rosettes to friends and strangers alike. On second thought...I live in a small town, so such freakitude might give me a reputation as That Crazy Woman Who Won't Shut Up About Her Swiss Buttercream. If I lived in a larger city, I'm sure this behavior would be at worst ignored and at best celebrated as an example of what makes city life so vibrant and interesting. As it is, I have conquered Swiss buttercream and I have the Daring Bakers to thank. Enough of my rambling. The recipe for filbert gateau with praline buttercream is a long one, indeed, so I shall take up no more space here. If you are feeling daring -- indeed, if you are just feeling patient, measured, disciplined or hungry -- give this cake a whirl. You will be very inspired and pleased that you can accomplish such a pastry feat. You, too, will be gateau fabulous. I split up the tasks required to make this cake over three days, which is the only sane way to manage such an endeavor. To try to do it all at once I believe is madness. Friday night I clarified the butter, toasted and skinned the hazelnuts and made the sugar syrup and the praline paste. Saturday night I baked the gateau. Sunday night I made the praline buttercream and the blackberry glaze, whipped the heavy cream and assembled the cake. Then some friends came over and we ate it on the front porch while relaxing on the aforementioned newly-painted antique wicker. Not a bad way to toast the waning hours of the weekend. 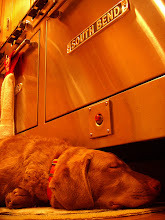 1 c. sugar, divided into 3/4 c. and 1/4 c.
Position rack in the lower third of the oven and preheat to 350 degrees Fahrenheit. Grease and flour a 10" x 2" round cake pan or a 10" Springform pan. (Or you can use Pam with flour, which I use and honestly, it works like a charm and is SO much easier than buttering/flouring the pan.) I used a Springform pan and removing the cake was a snap. Add the hazelnuts, cake flour and corn starch to the bowl of a food processor. Process for about 30 seconds, then pulse the mixture 10-15 times until the mixture is fine and powdery and it begins to gather around the sides of the bowl. Make sure that there aren't any large pieces of hazelnut remaining but do not over-process. Set aside. Place the egg yolks in a medium mixing bowl and, using a hand mixer, beat until they're thick and light in color, about 3-4 minutes on medium-high speed. Add 3/4 c. sugar, about one tablespoon at a time, to the yolks, taking about 3 minutes for this step. When finished, the mixture should be ribbony and a very light shade of yellow. Blend in the vanilla and lemon zest. Set aside. Place the egg whites in the clean, dry bowl of an electric mixer fitted with the whisk attachment and beat on medium speed to soft peaks. Increase to medium-high speed and slowly add the remaining 1/4 c. of sugar. Scrape down the sides of the bowl and continue to beat for another 30 seconds. Add the yolk mixture to the whites and whisk for 1 minute. Measure the warm clarified butter. Sprinkle the hazelnut mixture, about 2 tablespoons at a time, into the bowl containing the egg mixture. Fold after each addition to incorporate the hazelnuts into the eggs. The goal here is not to deflate the egg mixture, so fold gently. When about 2 tablespoons of the hazelnut mixture remain, pour the warm butter into the batter. Then add what remains of the hazelnut mixture and fold the batter about 13 times to incorporate. With a rubber spatula, transfer the batter into the prepared pan, smoothing the surface. Tap the pan on the counter once to remove air bubbles and bake for 30-35 minutes. Then cake is done when it is springy to the touch and pulls away from the side of the pan. Remove from the oven and allow the cake to stand for 5 minutes. Invert onto a cake rack sprayed with non-stick coating and remove the pan. Cool the cake completely. If not using the cake right away, wrap thoroughly in plastic wrap and refrigerate for up to 3 days. The cake can also be frozen -- wrapped in plastic wrap and then aluminum foil -- for 2-3 months. In a small heavy saucepan, bring the water and sugar to a boil and simmer for 5 minutes. Remove from heat and add the Cointreau. Cool slightly before using on the cake. The sugar syrup can be made in advance. I made mine two days before I assembled the cake and stored it in a mason jar at room temperature. Just before applying it to the cake, warm the syrup slightly in a small saucepan over low heat. Using a rubber spatula, blend 1/2 c. Swiss buttercream into the praline paste. This lightens the praline paste and makes it easier to incorporate into the buttercream. Add the rest of the buttercream and stir well. If using, mix in the Cointreau. Place the egg whites in the bowl of an electric mixer and beat with the whisk attachment until whites are foamy and they just begin to thicken (just before the soft-peak stage). Remove the bowl from the mixer and set it over a saucepan containing about 2 inches of simmering water, making sure that the bottom of the bowl is not touching the water. Using a hand-held whisk, mix the sugar into the egg whites about 2 T. at a time, whisking well between additions. Continue whisking for another 2-3 minutes until the egg whites are warm (about 120 degrees Fahrenheit, if you have a probe thermometer, or you can judge by sight -- the egg whites should look thick and similar to whipped marshmallows). 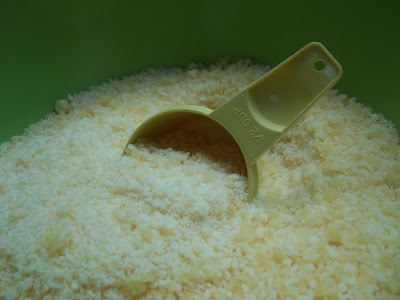 Place the butter in the clean, dry mixing bowl. Using the paddle attachment, cream the butter at medium speed for about 1 minute, or until the butter is smooth and creamy. On medium-low speed add the meringue, about 2 T. at a time, to the butter. Add the liqueur and vanilla and mix for a few minutes until the buttercream is smooth. Scrape down the sides of the bowl and mix for another 30 seconds to make sure all the ingredients are incorporated and the buttercream is thick and creamy. Remove the buttercream from the mixer and refrigerate, covered, for 10-15 minutes before using. Line a jelly roll pan with a Silpat, or with buttered parchment. The Silpat works so beautifully here that if you don't have one, I'd recommend going out and getting one. It's the best $20 you'll ever spend -- at least the best $20 you'll ever spend on baking tools. Place the sugar in a heavy 10-inch skillet. Heat over a low flame for 10-20 minutes until the sugar begins to melt. Watch the sugar closely; there is an extremely fine line between sweet and delicious and burnt and bitter. Swirl the pan to prevent the melting sugar from burning. If the sugar is not melting uniformly, go ahead and stir it gently with a wooden spoon. Do not take your eyes off the pan. Do not answer the door. Do not look up to figure out what just happened on Law & Order. Ignore your husband. Sugar-melting is serious business that requires the cook's undivided attention. When the sugar is completely melted and caramel in color, remove from the heat. Stir in the hazelnuts with a wooden spoon or rubber spatula and separate the hazelnut clusters as best you can. Return to low heat and cook until the mixture starts to bubble, stirring often. I will say it again: keep your eye on the prize. You know Bobby Goren is going to get the suspect to talk; if you turn away from your praline to confirm this, chances are your sugar will burn. Pour the hazelnut-sugar concoction onto the Silpat-lined jelly roll pan and spread it out as evenly as possible. Allow it to cool and harden into brittle. Break the candied hazelnuts into pieces and place them in a food processor. Pulse into a medium-fine texture and then process until the brittle turns into a powder. Process for a few more minutes and, magically right before your very eyes, the powder will turn into a paste. It really is quite remarkable. Store praline paste in an airtight container in a cool, dry place. Do not refrigerate. In a small, heavy saucepan bring the preserves and water to a boil and simmer for 2-3 minutes. If the mixture begins to stick to the bottom of the saucepan, add water as needed. Remove from heat and press the mixture through a wire mesh strainer. Discard the remnants. Can be made in advance; just cover tightly and refrigerate, warming it gently before you're ready to use it. Mix the Cointreau and vanilla together; set aside. Break the chocolate into 1-inch pieces and place in a food processor. Pulse until finely chopped. Transfer the chocolate to a medium-sized bowl and set aside. Heat the cream and corn syrup in a saucepan over low heat until it reaches a gentle boil. When it boils, immediately remove from the heat and pour the cream mixture over the chocolate. Let stand for one minute, then slowly stir to melt the chocolate and incorporate the mixture. Carefully mix in the vanilla mixture. Let cool slightly before using. And now that you've done all that, assemble the cake! Your masterpiece lies in pieces all around the kitchen; it's time to put it all together. With a hand-held mixer or a stand mixer, whip 1/2 c. of heavy cream to soft peaks; set aside. Using the cake pan as a template, cut a cardboard disk slightly smaller than the cake. I buy cardboard in the cake decorating section of my local craft store; I'm sure you could use a plate the size of your cake, but the flat cardboard really does facilitate easy assembly. Using a serrated knife, divide the hazelnut genoise into three even layers. I find it works well to place the cake on a lazy susan, hold the knife still and rotate the cake as you apply gentle pressure to cut the layers. Place the cardboard round on top of the cake, then invert to release the first layer of the cake. It should be cut-side up. Using a pastry brush, moisten the layer with 3-4 T. of warm sugar syrup. Measure out 1 c. of praline buttercream and set aside. With an offset spatula, spread the bottom layer with about 1/4 inch of the remaining praline buttercream, leaving a 1/4-inch border around the edge of the cake. Cover the buttercream with about half of the whipped cream. Place the middle cake layer over the first. Use a wide spatula to help you move the thin layers, which will lessen the chance of breakage. Brush this layer with sugar syrup, spread with about 1/4 inch of praline buttercream, then with the rest of the whipped cream. Moisten the cut side of the third cake layer with the remaining sugar syrup and place, cut-side down, on the cake. Gently press on the sides of the cake to align the layers. Refrigerate and chill for at least 30 minutes. Remove the cake from the refrigerator and, using a serrated knife, cut a slight bevel around the top edge of the cake to help the ganache drip over the edge. With a pastry brush, brush the top and the sides of the cake with the warm blackberry glaze, "sealing" the cut areas completely. Chill while you prepare the ganache. Place a cooling rack over a baking sheet to catch the ganache drip, then place the cake on top of the cooling rack. With a metal offset spatula in hand, and holding the ganache about 10 inches above the cake, pour all of the ganache onto the cake's center. Use the metal spatula to help ease the ganache over the sides of the cake. It should flood to coat the top of the cake very nicely but it might need some help on the sides; spread it around the sides with the metal spatula if necessary. Let the cake stand at least 15 minutes to set, or refrigerate. When the ganache sets, you can place the 1 c. of reserved praline buttercream in a pastry bag fitted with the tip of your choice and just go to town -- decorating the top of the cake to your heart's content. Garnish with toasted hazelnuts. Leftover cake can be placed in a cake keeper or covered with aluminum foil and refrigerated for up to 5 days. If it lasts that long. I am aware that I overuse superlatives. Especially when writing about food. Sometimes I just cannot help it: food is so marvelous, so delicious, so lovingly tied to life's best memories, so full of potential and tastes to be discovered and worlds to be explored that, well, describing it with tepid language just seems unfair, lazy and dishonest. So it is with profound awareness of my unbridled enthusiasm that I must state that of all the pestos I've ever tried -- and there have been some great ones, to be sure -- the recipe I've been using since I was old enough to operate a Cuisinart is the best one. The best! And I don't even feel bad about saying that. Well, I feel a little bad, as my second bad habit, behind excessive suplerlativeness, is a tendency to muzzle proclamations of my own success. I don't want people thinking I'm full of myself. Because what I am full of is pesto. There is no room left for ego. Though I do make pesto all year round, nothing compares to the batches I make from my own basil (or Mom's basil, or Sister's basil), grown right in our back yards. Buying fresh basil from the grocery store in the middle of December will suffice, but there is a freshness and a goodness and a wonderful feeling of self-sufficiency and accomplishment that comes from pesto made from basil grown from seed under your own watchful eye. Nothing beats basil that is still warm from the sun. Well, except tomatoes that are still warm from the sun. Indeed, put those two crops together and you've got...significant inspiration for another post. As with most recipes that I cherish the most, this one comes from Mom and Dad. But I make it so much more than they do nowadays that I like to think of it as my own. It's ours, at any rate. 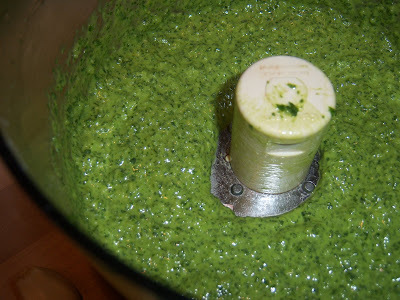 This pesto recipe has become, for me, one of those recipes that you just know by heart. Its origins are unknown; where Mom and Dad got it is somewhat of a mystery. Maybe it came from someone back in New Castle, PA, their hometown. Maybe it came from someone in their Dinner Club. Maybe they found it in some 1970s issue of "Bon Appetit." Maybe they made it up. Who knows? Who cares? I have made a few adjustments to the recipe over the years. For example, I always substitute walnuts for pine nuts. What started out as a way to save a little money by eschewing the expensive pine nut for the more affordable walnut morphed into a genuine preference for the walnut taste. When I make pesto for my friend Amy, who is allergic to walnuts, I of course turn to the pine nut. But, in my humble opinion, the dish suffers for the switch. Walnuts are meatier, nuttier, earthier, more flavorful -- the play much more harmoniously with the homegrown herbs than do the pine nuts. I also use Pecorino cheese instead of Parmigiano-Reggiano. Sheepy Pecorino is sharper and saltier than Parmigiano-Reggiano and adds a zing to the sauce that its aged cows'-milk compadre misses. 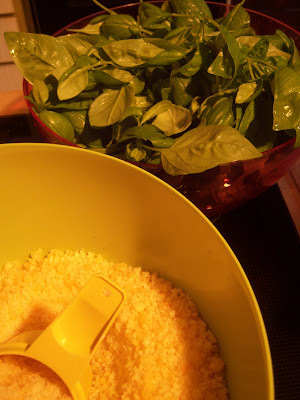 I made some pesto recently with Parmigiano-Reggiano -- there was no Pecorino in the house -- and the difference was clear. Even Husband noticed that something was off. 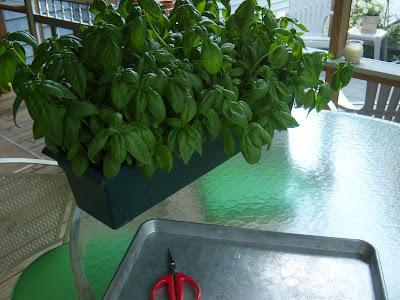 If you have a forest of basil growing on your back porch, now is the time to harvest it and start making pesto. 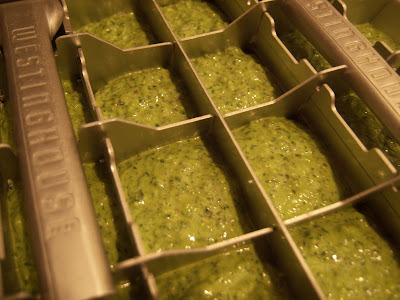 Make lots and lots at once, for this pesto freezes beautifully in ice-cube trays (I prefer the old-school metal ones, available for a steal on eBay or if you're lucky from your grandmother's freezer, as they make extracting the frozen pesto a truly simple task). I'd like to say that you will be very happy, come winter, to pull a few pesto cubes from the freezer and prepare yourself a dinner to recall summer's happy, long days...but who am I kidding? You'll have gone through your freezer's supply before Labor Day. This recipe could not be simpler. 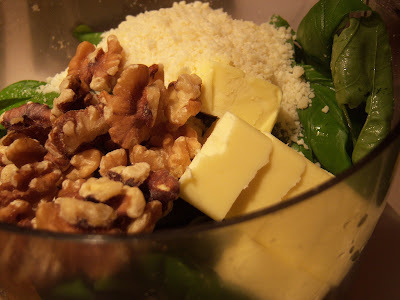 Place basil, parsley, garlic, butter, walnuts and Pecorino in the bowl of a food processor. Pulse until the mixture is finely chopped, but do not over-process. Restart the food processor and add the olive oil in a stream until the pesto comes together. Scrape down the sides of the bowl and then process for another few seconds. Presto: pesto! If you are going to use it right away, bring a large pot of salted water to a boil and cook one pound of pasta per the package directions. Drain the al dente pasta, reserving the starchy cooking liquid. Place about half of the batch of pesto you just made into a large bowl with the drained pasta, adding a ladle or two of the pasta water. Stir to coalesce the pesto into a creamy sauce and coat the pasta. Top with grated Pecorino, to taste, and serve immediately. Place the remaining half of the pesto in a plastic container, push a piece of plastic wrap down onto the surface of the pesto and cover. Refrigerate and use within 2-3 days. 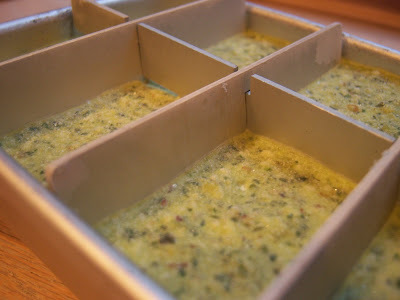 If you wish to make several batches at once and freeze them in ice cube trays, simply spoon the sauce into the trays. 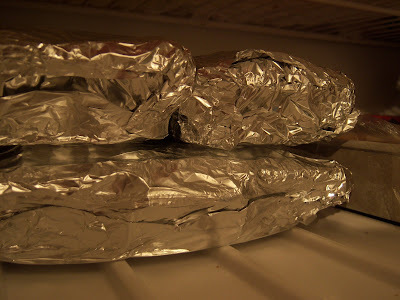 Triple-wrap the trays in plastic wrap then cover in one layer of aluminum foil to prevent freezer burn. When the cubes are frozen, release them from the trays and store them in heavy-duty freezer bags for up to 4 months. When you are ready to use the frozen pesto, make sure that you don't defrost the pesto in the microwave or in a saucepan. The sauce should never be cooked: it kills the fresh flavor and turns the basil an unsightly brown. Instead, remove your pesto cubes from the freezer about 10 minutes before you start cooking, placing them on the counter in a serving bowl. Then boil water and cook pasta per usual. Do not throw away the pasta cooking liquid; rather, drain the pasta in a colander or sieve set over a large bowl. 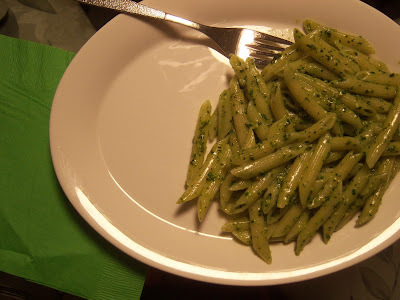 Place the hot, drained pasta on top of the pesto in the bowl -- the heat of the pasta will begin to melt the pesto. Then add a ladle or two of the reserved pasta water to the serving bowl, which loosens the pesto and creates a rich sauce. Stir well. Thus you will have a wonderfully home-grown, homemade supper on the table in basically the time it takes you to cook a pot of pasta. Ingenious! Finally, I would be remiss if I did not state that pesto does not have to be limited to pasta. Spoon some over grilled chicken breasts; use it as a sandwich spread; mix it with steamed vegetables; put it on a simple grilled pizza; eat it with a spoon in a piggish fashion; use it as a garnish for soups. 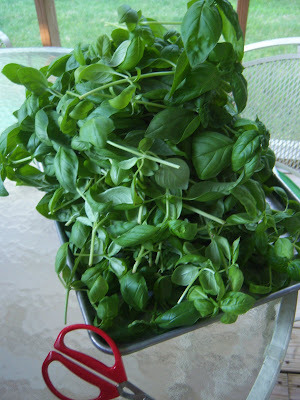 The possibilities are as endless as the bountiful basil harvest this time of year. One batch -- or "go," as Mom calls it -- makes enough pesto to dress 2 pounds of pasta. As I blog I'm lucky enough to be on the beach in South Carolina for my family's annual trip to Grandma's Other House. I wasn't planning on writing this week, but, lo! I can get a signal from the lanai! Thus, I thought this would be an excellent time to tell you about a salad that we make each time we're down here that we've rather appropriately dubbed "lanai salad." It's falafel on a lush bed of salad greens, dressed by Sister with a perfect olive oil and lemon juice vinaigrette. (She is so good at this task that I joke that she's earned a Master's degree in dressing salads -- an M.S.D.) Though you don't have to be sitting on a lanai to enjoy lanai salad, I won't lie to you: it definitely helps. The first time I came to Grandma's Other House -- around 1996, before it was known as Grandma's Other House; indeed, several years before Grandma was a grandma -- I remember making a falafel-topped salad with Mom and enjoying it on the porch. It was so good, the two of us ate the whole bowl. We decided the salad deserved a name of its own, and what better place to inspire a name than an open-air lanai overlooking the ocean. That particular trip is rich with memories: just Mom and I were here, enjoying a (apologies for the extremely cliché concept) girls'-week-at-the-beach. I was going through some of the "off" parts of my on-again, off-again relationship with The Fellow Who Would Eventually Become Husband, and a week at the beach was a perfect way to get my mind off him and on myself and the fun relationship I enjoy with my mother. Lanai salad was born at the same time as the yearly tradition of traveling to this beach; the dish's inception also coincides with the somewhat tumultuous beginning of what would become a lifelong partnership with my best friend and the love of my life, even if I didn't know it then. I suppose that's quite a bit of nostalgic weight to place on lanai salad's zesty vegetal shoulders, but with all that spicy, filling falafel and tangy lemon dressing, it can handle it. Now, I am completely aware that falafel on salad is not a particularly groundbreaking dish. It isn't even much of a recipe: in fact, it's quite acceptable in a pinch to make a salad and top it with freshly-fried falafel of the Near East boxed variety. But since I would feel very slackerly posting a "recipe" for boxed falafel atop a bowl of triple-washed greens from a bag, well, I had to complex it up a bit. Enter Joan Nathan, Jewish home cook extraordinaire. Shall I point out the obvious? Once you make homemade falafel, trust me, you won't be reaching for the box anytime soon. Joan's recipes are marvelously authentic and totally delicious. I always seek them when preparing holidays meals for Husband, or just when I feel like trying something new. Her recipe for falafel doesn't disappoint. Simple to prepare (even when you're at the beach and don't have access to a food processor or, really, much of anything in the way of cookware! ), immensely flavorful and pleasantly nourishing, this falafel is definitely the way to go. Indeed, if you're at home and within close range of a Cuisinart, homemade falafel takes barely longer to prepare than the boxed version. And its taste and texture is so vastly superior I really don't see a reason not to put in the iota of extra effort. Of course, you can serve this falafel in a pita with some sliced tomatoes, lettuce, a round of cucumber or two and a little tahini -- but, well, the recipe isn't called "lanai sandwich." The ocean is calling me. I cannot prattle on too long, not in these surroundings. 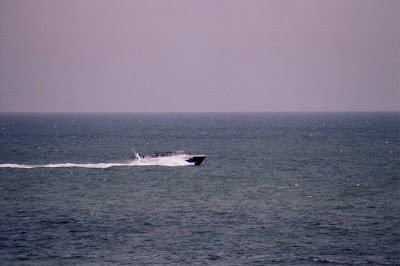 But before I go, I would be remiss if I did not mention that the party boat seems to have been replaced by some newer-looking but just as ridiculous vessel, Sea Thunder, which loudly makes its reveler-filled presence known each afternoon. Guess what? We dutifully point at it and laugh like hyenas. I wish you all many servings of lanai salad and a very happy vacation -- even if your vacation consists of no travel whatsoever but rather a few hours you're able to carve out for yourself on a Saturday to do strictly what you want. Salad dressing courtesy of Sister, Sue Ketler, M.S.D. About one hour ahead of time, make the falafel. Place the chickpeas, onion, parsley, cilantro, salt, hot pepper flakes, garlic and cumin in the bowl of a food processor. Process until blended but not pureed. Sprinkle in the baking powder and 6 T. of the flour. Mix together with your hands, adding the rest of the flour one tablespoon at a time, up to 10 T. total. You want to be able to form the mixture into a ball easily, with only a minimum of sticking to your hands. It takes about 10 T. of flour, total, when I make it. Form the mixture into a ball and refrigerate it, covered, for about a half-hour. While the chickpea mixture is chilling, assemble the vegetables for the salad in a large bowl but do not dress it. You'll want to dress it at the last minute. Remove the chickpea mixture from the refrigerator and form it into walnut-sized balls. Heat about 1 inch of vegetable oil in a dutch oven or large skillet to about 375 degrees Fahrenheit. Over medium heat, fry about 6 pieces of falafel at once, turning a few times, until the balls are a golden brown -- about 8-10 minutes. It's important to do this over medium heat, as frying on high heat will cause the falafel to burn on the outside before the inside is cooked. Remove the falafel to a plate lined with paper towels and allow to cool slightly. Dress the salad. Pour the olive oil and squeeze the lemon juice over the salad; mix. Add the salt and freshly ground pepper. Taste and adjust for salt and oil. This seems quite simple but trust me: Sister says that the key to this deliciousness is not to skimp on the salt and oil. It might not be lo-cal, but olive oil is a good fat. Add the feta cheese and falafel to the salad. Toss to mix and coat with the dressing. Serve while the falafel is still warm; the heat and crunch of the falafel is such a nice foil to the cool salad. The falafel recipe makes about 14 pieces; the salad serves 4-5 comfortably.